The Seahawks don't expect Tedric Thompson be a facsimile of Earl Thomas, but they need the results to be similar. Earl Thomas had a little message for his replacement in the Seahawks defense when the two chatted on Tuesday. “Just have fun and just play with confidence,’’ said Tedric Thompson of what Thomas offered for advice as he prepares for his first NFL start Sunday against the Los Angeles Rams at free safety. Thompson couldn’t have asked for a tougher opponent against whom to make his first NFL start with the Rams leading the league in total offense (468.5 yards per game) and ranking second in passing offense (343.3) and points per game (35.0). It’s an offense that undoubtedly will test Thompson early and often in what is only the eighth regular season game Seattle will have played since 2010 without Thomas as the last line of defense. Thompson repeated “I feel comfortable” several times when talking to reporters Wednesday, pointing out he spent the offseason working as the team’s No. 1 free safety while Thomas was holding out. Still, practice and games are two different things — Thompson, a fourth-round pick in 2017 out of Colorado, has just 66 defensive snaps in his NFL career, about the equivalent of one full game. All but eight have come this season and most in the team’s dime package, when he has entered as a free safety with Thomas usually moved to a slot position. But Thompson has also played 20 snaps when Thomas was either being rested in the opener against Denver, or last week on the final series after Thomas was carted off with a broken left tibia. And as they usually have when Thomas has missed games in past seasons, the numbers paint a pretty stark picture of how Seattle’s defense has fared with Thomas and without him. 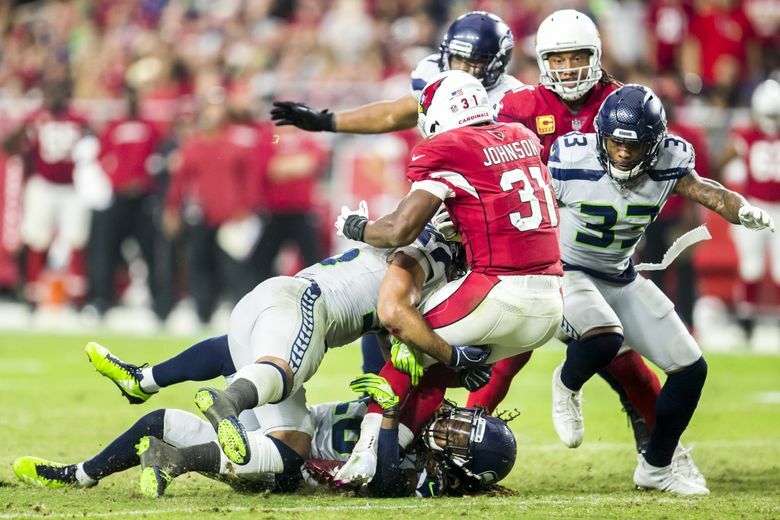 Via Pro Football Focus, the Seahawks allowed 5.0 yards per play on 227 snaps with Thomas this season, which would rank fifth in the NFL (Seattle is seventh overall at 5.2 yards per play). On 20 plays without Thomas, Seattle has allowed 7.9 yards per play — Tampa Bay is last in the NFL in yards per play at 7.0. Consider further that on 20 snaps without Thomas, Seattle has allowed six plays of 10 yards or longer (30 percent). With Thomas, Seattle has allowed 42 plays of 10 yards or longer on 227 snaps (18.5 percent). Seattle had a fairly similar dropoff in 2016 when Thomas missed the final four games of the season and both playoff games after also breaking his leg. After having led the league in fewest points allowed per game every year from 2012-2015, Seattle was again leading the NFL in fewest points allowed in 2016 (at 16.2) when Thomas was sidelined for the season when he broke his leg in a 40-7 win against Carolina. Seattle allowed 38 the following week at Green Bay in what was the first loss by 10 or more points in 85 games (an NFL record) and allowed an average of 23.3 in the final six games (four regular season and two playoff). Those games came with Steven Terrell filling in at free safety alongside Kam Chancellor. The results were better when Thomas missed two games at midseason last year and Bradley McDougald filled in at free safety alongside Chancellor — a 17-14 loss to Washington and a 22-16 win at Arizona. Linebacker Bobby Wagner, who is now the only remaining member of the defense that beat Denver in the Super Bowl, said Wednesday that Seattle will be able to run the same defense it always has. Still, Wagner also noted that Thomas is simply going to be hard to replace. “I think scheme-wise it doesn’t change,’’ Wagner said. “I think it’s more so just the player. Like I said, Earl’s a different guy. His range through the field is something off the charts, so that is different. We’re extremely confident in T-2, Tedric Thompson. Thomas said his understudy Thompson “had like four picks at practice’’ the week Thomas returned from his holdout. Carroll also said Wednesday that he was impressed by the way Thompson didn’t let his return to the bench get him down. Thompson doesn’t have to worry about that now. The future the Seahawks began preparing for in the 2017 draft when they selected four defensive backs — potentially an entirely new Legion of Boom — has now arrived. What kind of success Seattle enjoys through the rest of the season basically depends on it.